This year I have been looking at charities that give to kids in need as a place to find holiday gifts. 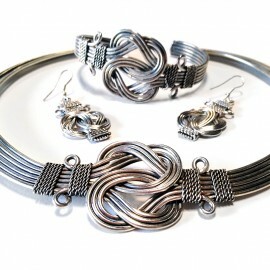 I can get a wonderful present and have the proceeds going to a program that helps people in need. With my new job I am finding myself in need of new jewelry and accessories and the ones I found at World Vision were great. They are colorful and handmade by people who are benefiting from the purchase.You can find many more items from the World Vision catalog such as toys and household gifts for the holidays. World Vision serves close to 100 million people in nearly 100 countries around the world. World Vision serves all people, regardless of religion, race, ethnicity, or gender. For my review I was sent the Artisan Beaded Necklace. The necklace is beautifully colorful and adds a great touch of color to a plain shirt. I have worn this several times to work and have been asked where I purchased it. Its nice to share the story on how World Vision helps people in need and they make products they can sell. 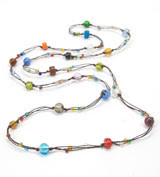 This glass-bead necklace is handmade in Thailand and can be worn several different ways — even as a multi-strand bracelet. 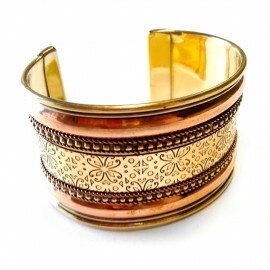 The World Vision store has many beautiful jewelry pieces you can buy for yourself or give as a gift. You can even make donations that will go directly to help families in need here in the USA. You can shop the World Vision Gift Catalog Facebook page at http://www.facebook.com/worldvisiongiftcatalog?fref=ts and World Vision’s Pinterest page at http://pinterest.com/worldvisionusa/. *Limited to US residents 18 years old and above. Giveaway starts Nov. 21, 2012 and ends on Dec. 12, 2012 at 12:00 am PST. Winner will be emailed and has 72 hours to respond before another winner is selected. I was not paid for this giveaway or post. The opinions on this item are 100% mine and may vary from others. The sponsor is responsible for providing the prize. I was sent a product to review for this post. I would like Artisan Multi-colored Necklace.